Check out the recaps from different mission activities here. 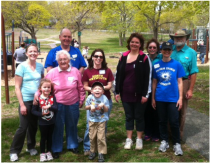 Pilgrim Church and the North Weymouth Civic Association joined forces to clean up Beals Park for the town-wide clean up day. 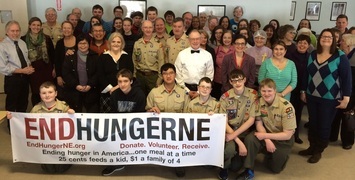 Pilgrim joined other South Shore faith communities and Boy Scouts to purchase supplies and package over 12,000 meals to be distributed to food pantries and other local agencies in Weymouth, Quincy, Braintree, and Randolph. Additionally the first Sunday of every month (Communion Sunday) the church offers non-perishable food items which are blessed and donated to the Weymouth Food Pantry. Each year, Pilgrim Church has a "Giving Tree" that we decorate with donations for a local agency doing good work in the community. 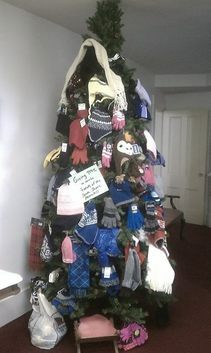 This year, we're collecting hats, scarves, mittens, and gloves for the Friends of the South Shore Homeless. Beginning in June and monthly through November, Pilgrim members and friends made table decorations for the annual Friends of the Homeless of the South Shore children's Christmas party. Pilgrim handed out tickets to the pumpkin patch at the town's annual Great Pumpkin Give-a-Wey. Thanks to everyone who stopped by! Pilgrim members and friends volunteered at the Prison Book Program in Quincy and, along with others, prepared hundreds of packages of books to go out. Prisoners have limited access to educational materials and PBP provides free books for personal development during incarceration because education is a powerful tool that reduces the likelihood that a prisoner will return to the prison system. 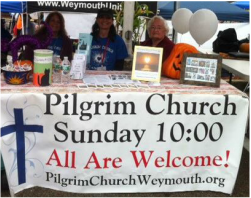 Pilgrim Church had a booth at the the North Weymouth Neighborhood Day in August of 2014. Several hundred of our neighbors came to this free event. 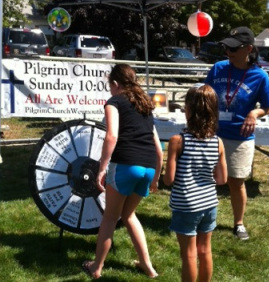 Pilgrim invited folks to spin the prize wheel for Christian-themed bracelets, magnets, angels, tea light holders, teddy bears, and beach balls. "When you have faith, you win!" 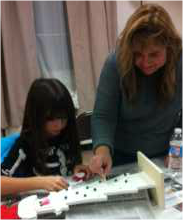 The event was sponsored by the North Weymouth Civic Association. 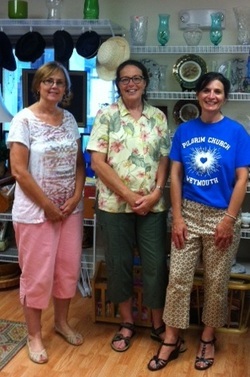 In July, we volunteered at the Interfaith Social Services Bureau Drawer Thrift shop. The Bureau Drawer is staffed entirely by volunteers. Donated items are sold and the proceeds fund ISS programs. Learn more about Interfaith Social Services by clicking the link. Raffle items included: One Direction concert tickets, new Coach handbag, Cathay Center Restaurant gift card, George Washington Toma Appliance gift card, Kelly's Landing Restaurant gift card, YES concert tickets, Pizza Plus gift certificates, Handcrafted silver bracelets, Trader Joe's groceries, Stockholders Restaurant gift card, Hartstone Florist plant, Noreen's Finally Hair gift card, Brighton clutch bag, Hand painted garden chairs with potted plants, The Mooring Restaurant gift certificate, Impressions Hair Salon, Whole Foods,gift basket, Christopher's Garden Center gift card & more. Thanks for all the donations! In May, we put the focus on the environment with a program called "Caring for Creation". Dave McGlinchey from the Manomet Center for Conservation Sciences talked about the human impact on the environment. We made herb gardens & sachets. Learn about the Manomet Center at Manomet.org. In May, Pilgrim Church partnered with North Weymouth Civic Association and the Weymouth Firefighters to clean Beals Park for the annual Clean-Up Day. About a third of the entire group is pictured here. We had about 30 volunteers and filled close to 100 lawn and leaf bags! A team from Pilgrim cooked and served lunch and dessert at Father Bill's Place in Quincy. Once the meal had been served, our team sat and shared the meal with the folks at Father Bill's. It was a nourishing experience that fed all in body, mind, and soul! 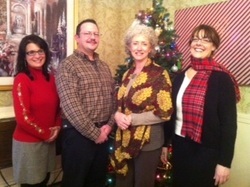 Pilgrim spread some holiday cheer by Christmas Caroling at Colonial Rehabilitation and Nursing Center in December. 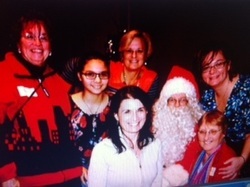 A group from Pilgrim helped out at the annual Friends of the Homeless of the South Shore Children's Christmas Party. Pilgrim's team made table and tree decorations. Learn more about FOHSS at www.FriendsofHomeless.org. Each December, the entire Pilgrim community gathers to help decorate the sanctuary for the holidays. All those ranging in age from 5 to 95 combine efforts and deck the church in splendor for the celebration of Christ's birth! Lori Grande from the JW & Lori morning show on WKLB, Country 102.5 was our Guest Scripture Reader in April, 2013. 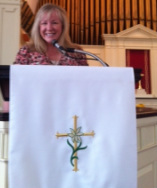 Magic 106.7's Candy O'Terry has also been a Guest Scripture Reader.